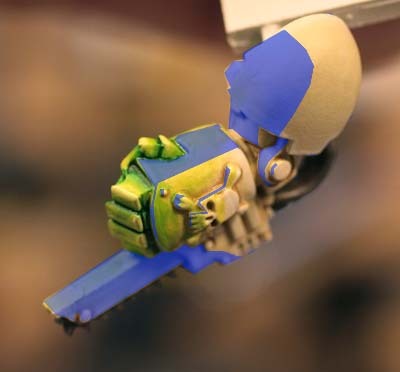 Here's a more in depth look at the mechanics if you will behind object source lighting (OSL) and how we can use this to make it work on our minis. Let me be very clear of three things before we get started. 1. This is NOT an attempt to point out what is wrong with other poeple's painting or their skill level. This is an attempt to use what people are willing to share with me and what I know to help everyone come away with a better understanding of this technique. 2. I am NOT an expert in this, I'd like to think I have the ability to help others understand this in addition to having the platform to do it with. 3. A huge THANKS to Black Matt and John for sharing their attempts at this technique and allowing me to use them in my posts here as examples. That being said, let's get to work. 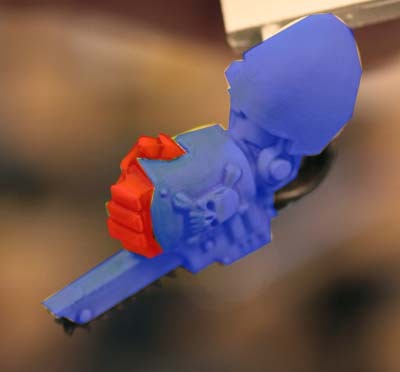 No sooner had I posted my original post on the glowing powerfist that I find John from 40k Hobby Blog has taken my directions to heart and given it a go for the first time in this post here. John has been gracious enough to allow me to use his example in this post just as Matt did in the first post. So let's look at what we have then. A glowing powerfist right? Close, but we're missing something. We've got the glowing object, the radiant light... but it's slightly off. To get this correct, we have to remember the things covered in the first post and we've got to stick to the laws of light if you will. Light behaves in certain ways. As long as our painting application of it follows those laws, we're ok. Stray from those laws and things just don't look right. A viewer might not know exactly how to explain it, but they'll just "know" it's wrong in some way. So let's back up and start at the beginning. Let's break our project down into two portions. The part that is glowing (red) and the part that will have the radiant light shining on it (blue). We've already covered the idea behind how to paint the "glow" meaning the same way we paint lava. I'm sure there are other ways out there, but this seems to be the easiest way for me to remember how to do it. Within the area that will have the radiant light shining on it (the blue area), there will be areas that are NOT going to be exposed to the light. For a number of reasons. It may be that it is blocked by something, it is on the side facing away from the light source, etc. We need to map those out so we know where exactly our light can fall in the surrounding area and where it can't. In this case, I've marked the areas that the light will NOT be in purple. This is something you will have to map out for every light source you have. And again, just like the first post, we are just keeping to this arm and not doing this in relation to a torso and legs that would be nearby. They too would need to be "mapped out." 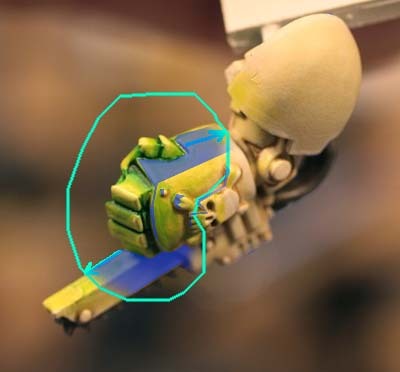 The picture above only shows this side and the top of the arm, you'd need to do the same thing for the inside of the powerfist and the bottom of the whole thing as well. Having defined what is glowing (red area) and what could be exposed to radiant light (the blue area with the purple area subtracted from it) we have all of our potential surface areas for radiant light figured out. The picture above shows you what's left of the blue area after we removed the purple sections. The next question is how far is the light going to radiate out from the source. Here is where John's example loses some of it's strength. The radiant lighting is not correct in what surfaces it falls on and does not maintain a consistent radius around the light source. If you look at the picture above, you can see the different lengths of the red arrows. In some places, the light travels very far, in others, it travels next to no distance at all. This inconsistency is enough for the viewer to look at it and feel like something is not right. To get it right, you need to determine a distance that your light is going to radiate outward and stick to it. No lighting after that point and everything within the radius that can have radiant light on it (the blue area minus the purple area) gets lit up. 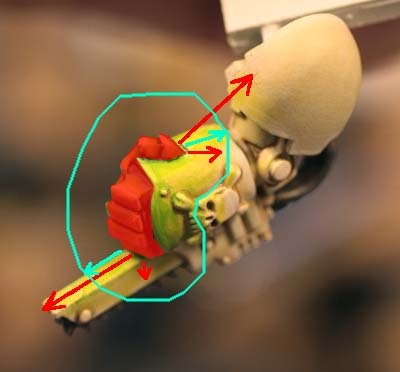 The green arrows define a smaller radius that would be consistent across the powerfist. It takes into account only the shape of the glowing object itself, not the surrounding area. This radius has nothing to do with our non-glowing object surfaces. At this point, we are just trying to determine how far out our radiant light will travel. Here we have all the possible surfaces that the radiant light can fall on combined with the radius from our glowing object to show just how far and onto what our light will travel. This is our roadmap to painting our radiant light. The glowing portion is easy, just like lava... the radiant light can be a bit tougher. Your blends need to be smooth for the effect to work best and really be convincing. And here's what it should look like if the glow were orange (well kinda, I did this in Photoshop). If the surfaces are correct and the radius is consistent, the overall effect will be much more convincing. See how the glowing section is orange (obviously) and the radiant light travels the same distance along the back of the chainfist as it does up the chain guard in the front. The radiant light quickly covers the whole side of the chain guard (within the radius) since it is much narrower than the radius of the light. There's even a bit of backward lighting since the fingers come down and that part would be exposed to the light. Just a tiny portion though. 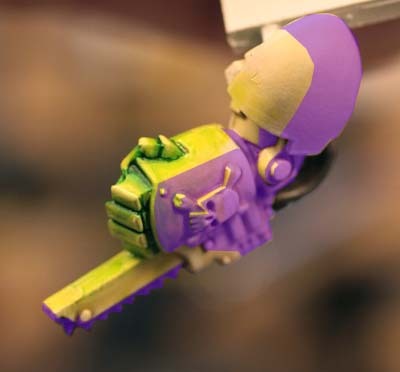 Even though the skull is attached to the back of the hand, it stands just high enough that some of the side of it would catch a little bit of radiant light from the thumb. Not much, just a little bit since it would fall within the radius and just on that side of the skull only. The face of the skull is not caught by the radiant light because it's facing too far away... like the majority of the back of hand. Hope this helps clear any confusion created by my first post. At this rate, I'll probably work on a post to show how this would work on a figure overall and how lighting a hand would affect the armour on the model's chest and/or legs along with other nearby sources. Part 3 on applying the radiant light onto other surfaces is here. 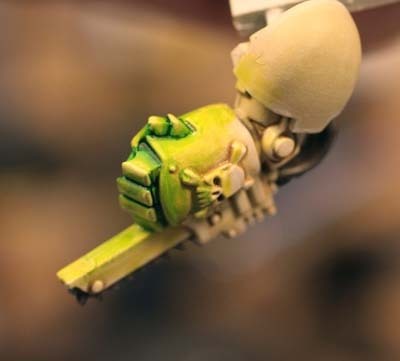 As someone who's beeen trying to add character to a necron force with lighting effects, and having failed repeatedly to get that "right" feeling, Im ecstatic about this post. My gutcheck was always pinging off, but it's nice to see some rational guidelines and tips to help explain why it was "wrong"
Useful blog, thank you. I have had mixed results (i.e. poor to bloody awful :) ) with lighting effects. Sigh. Adam: Glad it helps. I will be adding another post to this series in the coming week or so about how the effect is incorporated onto a whole model. John: I think your results are similar to most of ours including me sometimes. Things like this can be tough at first, but once you 'get the hang of it, it's a piece of cake. Great posts, I am learning a lot and looking forward to any more bits of wisdom you have to share before I begin my attempt at OSL. Brill, thanks for these great tutorials Ron and thanks to those who let you critique their work for our benefit. Really looking forward to the third enstallment, I'd love to use these guides to light effect a vermin Lord I've been working on. Crosser Modelling: It will take me a little bit to get that one otgether, but I'll be sure to post it. 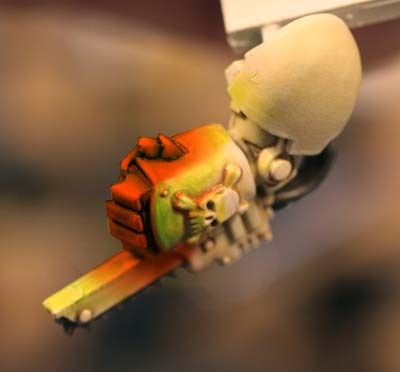 OK, so I've seen OSL done on light colours - but I don't suppose you have any tips for lighting dark colours (DA green for example)? Combat Apothecary: How do you mean? Like a dark glowing light source or a glowing source on dark colored armour around it? If it's the latter (the glow on dark colored armour around it), I will paint it DA green for my next example. A glow on dark coloured armour is exactly the thing I've been having trouble with - I'm just doing my tac termis now and was going to paint the fists bone to make lighting them easier, but if you can do a DA green example I would be thankful indeed! I will paint my model green tonight and do the effect on that.